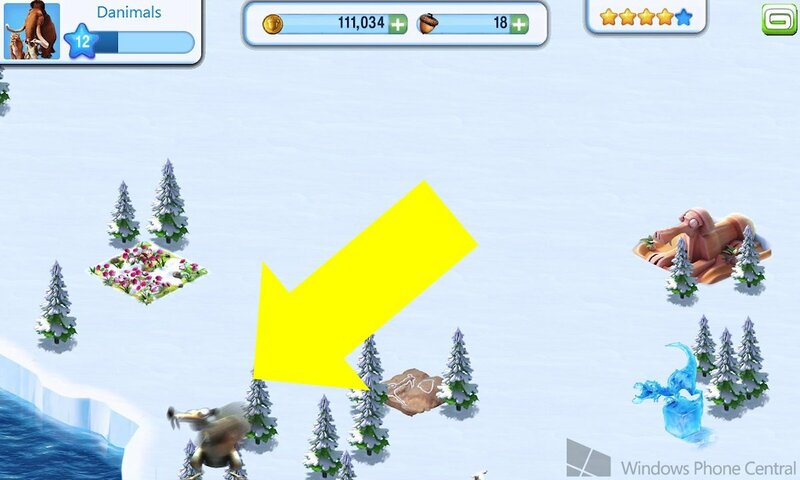 Ice Age Village from Gameloft is a free Xbox city building game for Windows Phone 8. As far as we know, any Windows Phone 8 device can run it and the game only takes up 79 MB of storage, so it should have a sizable player base already. The city building genre is a time consuming one since many tasks involve returning to the game at a later time or date to reap their rewards. Wouldn’t it be nice to speed up the process a bit and get your village making money faster right off the bat? Darn right it would. 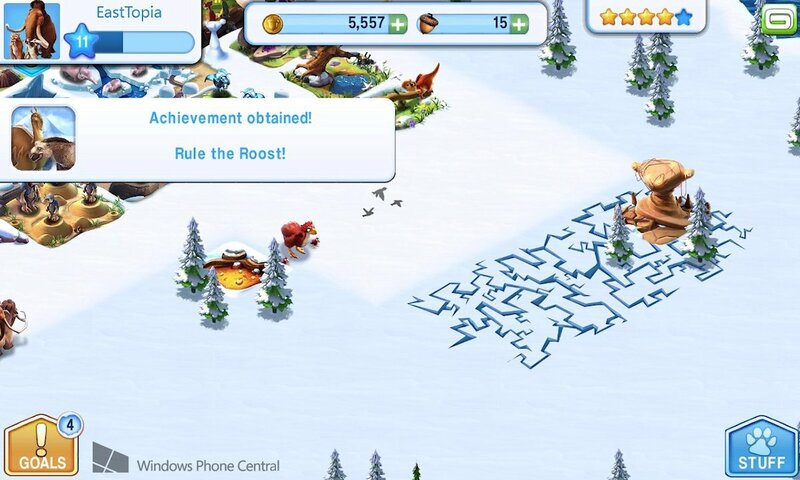 Windows Phone Central has a bunch of codes for free Coins, animals, and items, plus a handy Achievement guide. Don’t spend a single Acorn until you’ve read it! First off, let’s get those Coins and special animals. All you have to do for these is change your village name. 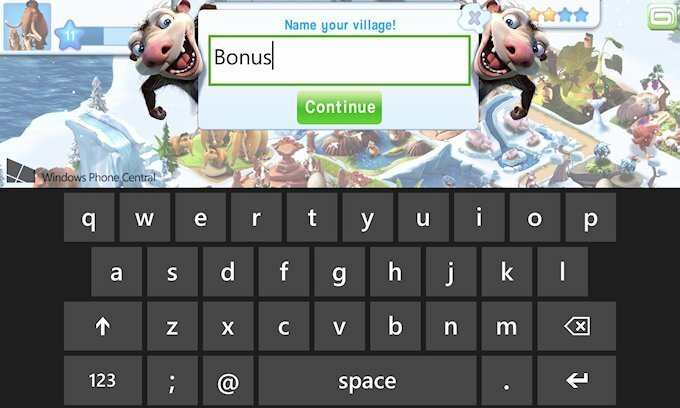 Tap the name of your village at the top-left corner of the screen and you'll be able to change the name. After receiving the bonuses, change it back to whatever you like. These codes are the gift that keeps on giving, because each special animal is part of a collection. Complete these animals’ families by buying a second adult and two children. Once the family and collection are complete, you’ll receive more rewards (as with any collection), including precious Acorns. Gameloft snuck in another trick that doesn’t involve a name change. Your village must have reached level 2 to pull this one off. 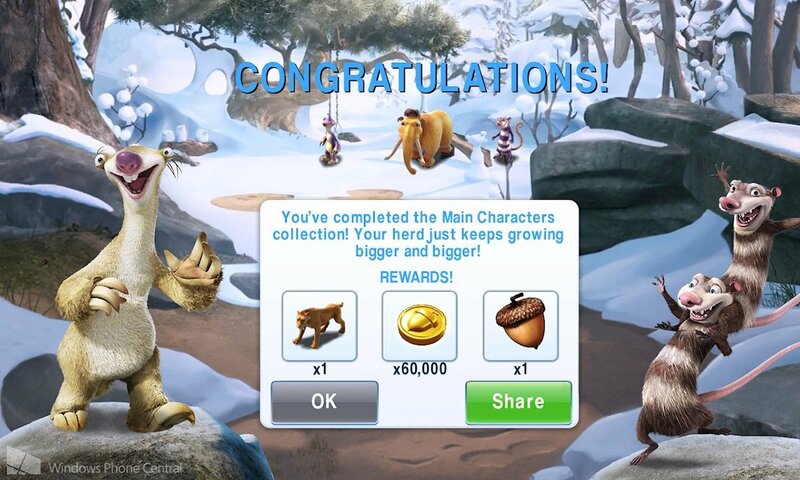 During gameplay, tap Sid the sloth four times and then Manny the mammoth three times (without tapping anything else in-between) and you'll get a bunch of coins and a snowy fox. Many of the game’s Achievements involve completing various collections of animals. The rub is that some of these animals cost Acorns, the game’s premium currency! Now, you can actually earn Acorns through gameplay. 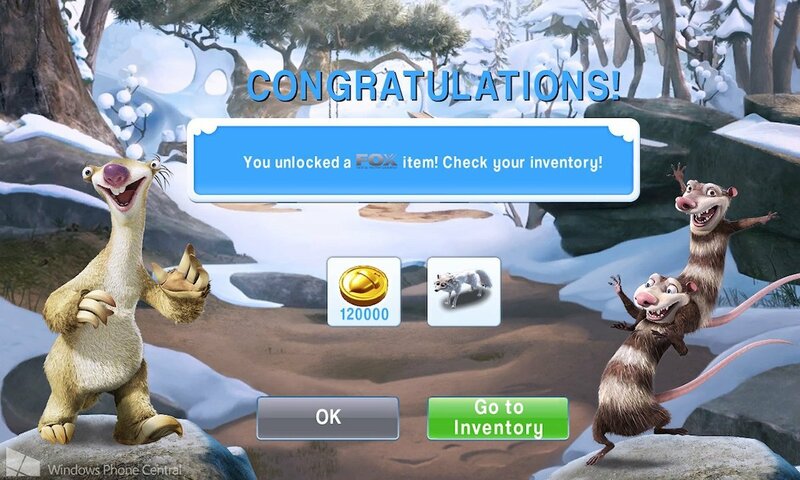 You’ll receive them for completing collections, as prizes in the Kung Fu Scrat minigame, in snow piles, and by leveling up. Still, Acorns don’t come quickly. If you want to earn all of the Achievements without going broke in real life, it’s imperative that you save them to buy the premium animals associated with these Achievements. When your village gains enough experience, it will level up. This usually a new animal or item and awards the player one Acorn. Villages gain experience from blue stars. Acquire these by feeding animals after collecting coins from them, completing goals given by the story characters, and completing collections. To level up faster, prioritize buying new animals over Fun Stuff (swings, etc.) since Fun Stuff doesn’t provide experience.. Expert Slasher – Win Kung-Fu Scrat three times. You'll gain access to the minigame early on when one of the main characters gives it to you via a Goal. To place the object, go to Stuff and then Collection. It looks like a small whirlpool. Once you've placed it, tap on the pool and choose to play the game. The game costs tokens to use. You get a free token to start with and sometimes find them within snow piles. You also get one free token per day from the Kung Fu Scrat object/building itself. If you don't have enough tokens to play, you can choose to use Acorns, but I wouldn't recommend it. For the purpose of the Achievement, you can just choose to Practice three times without spending any tokens. The minigame works like Fruit Ninja. Slash the blue fish that pop out of the water and avoid hitting a spiked puffer fish. You lose a life by missing a blue fish or hitting a puffer fish. Avoid running out of lives and try to get the highest score you can within 30 seconds. Rewards are completely random, not based on performance. You’ll want to keep coming back to the minigame whenever you have tokens in order to try for Acorns, but you don’t need to win any more. Losing right away will save time. I’m the Richest – Spend 30,000 on decorations. Just head to the Shop and purchase a few high-value decorations. This is cumulative, so you needn’t buy a single 30,000 Coin decoration. Most Famous - Get 5-Stars Village Status. Friends - Earn hearts by visiting other villages through the Social option and sending hearts to the village owners. All four ratings must be 5 stars in order to have 5 stars overall and get the Achievement. If your village has less than 5 stars overall, just look at which individual ratings are below 5 stars and work to increase them. The Friends rating is the most challenging one to raise up to five stars. You can only earn so many heart per day by visiting other villages. It will take at least 15 consecutive days to max out Friends and thus get this Achievement. Remember, Facebook and Gameloft Live integration is broken at launch. For now, you can boost your Friends rating by visiting random villages. Gameloft has promised a patch to fix the social network integration soon. Rule the Roost - Complete 7 land expansions. This doesn’t relate to an Achievement, but here’s a beginner’s tip. The longer you leave the game actively running, the more likely snow piles will develop and Scrat will run by. When Scrat appears, he’ll first pop his head out of the left or right side of the screen and make a sound. As soon as you see or hear him, scroll a little away from your buildings and start tapping the bottom corner of the screen below where his head popped out. You’re guaranteed to catch him and win Coins with this method. You can also find Scrat once daily when visiting another player’s village, though it works differently. He randomly hides behind an object and you’re tasked with tapping wildly to find him. A visual indicator appears over his head after a few seconds, but you’ll get more Coins if you find him before the indicator shows up. 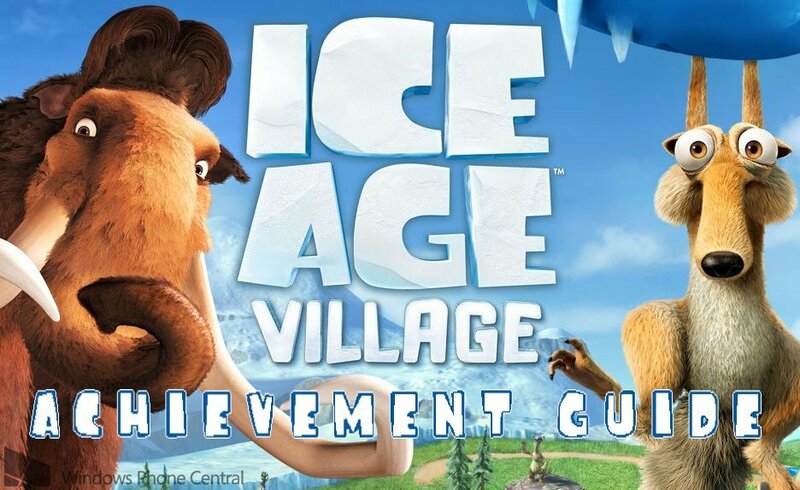 Ice Age Village is free for Windows Phone 8. Get it here from the Windows Phone Store. We’ve intentionally left time manipulation strategies out of this guide. Feel free to discuss those in our forums, but don’t mention them in the comments of this article.